Dogboe, and father/trainer Paul Dogboe, announced that they will hold their final press conference in Ghana on April 20, at the Kempinski Gold Coast Hotel in Accra. From there, they will head to the US as they enter the final stages of training camp for their May 11th rematch versus current WBO World Super Bantamweight Champion, Emmanuel Navarrete of Mexico. The return encounter will be Dogboe’s first bout of 2019, following a see-saw 2018. 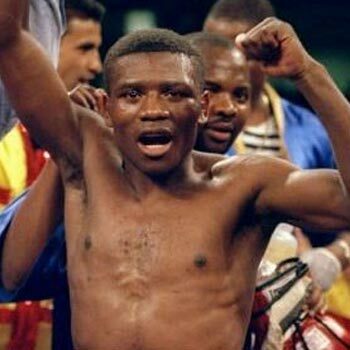 It began in January with “Royal Storm” thrilling his countrymen at Bukom Boxing Arena with a fifth-round TKO over Cesar Juarez. Then in April, Dogboe, 24, turned in the finest performance of his young career. Fighting for his first world title, versus then-WBO world super bantamweight champion Jessie Magdaleno, Dogboe put on a show. Following a rough first round where he tasted canvas, Dogboe pummeled Magdaleno to the body, dismantling him bit by bit and putting him away via 11th-round stoppage. Dogboe looked spectacular in his first title defense, a second-round KO over Japan’s Hidenori Otake in August. Then came the disappointing performance versus Navarrete in December. The Mexican used his superior height and reach to repeatedly catch Dogboe coming in while breaking him down to the body. Navarrete, also 24, dominated down the stretch to win a 12-round unanimous decision and become the new world champion. Dogboe, who had recently signed a co-promotional deal with Bob Arum’s Top Rank Promotions, will be looking to return to his winning ways. He’s already had an extended training camp in preparation for the rematch, training in Keta in his native Volta region. On Saturday April 20, Team Dogboe will hold that final presser before going to America, home of Isaac’s greatest successes and a reminder of the defeat he wishes to avenge. The rematch will be televised on ESPN, beginning at 10:00 PM ET.